Is my body fat percentage normal? Why should I control my body fat? This body fat calculator is a tool designed to help you estimate what percentage of your total body weight is body fat. If you ever wondered what is your body fat percentage, this is a perfect place to find out. We will explain to you in detail not only what is the importance of this information, but also how to calculate your body fat (including some alternative methods for measuring it) and give you some general guidelines regarding reducing your body fat. More than 98% of the human body is composed of six elements: oxygen, carbon, hydrogen, nitrogen, calcium, and phosphorus. Potassium, sulfur, sodium, chlorine, and magnesium are responsible for almost another 1%. These are the 11 most important, so called non-trace, elements. Regarding the molecules, the most common molecule in the human body is of course water, which takes about 65% of mass, followed by proteins and lipids. Other molecules which have a decent percent of mass are hydroxyapatite, carbohydrates and nucleic acids. It is actually adipose tissue; its main function is to store energy in the form of lipids, but it cushions and insulates your body, too. Your body stores two types of fat: essential and storage body fat. The former is necessary to support life and reproductive functions. Essential body fat is substantially higher for women because of childbearing and hormonal functions. Storage body fat is the mass of additional accumulated fat. It does not mean that this type of body fat is unnecessary, though - part of it protects your abdomen and internal organs. You can estimate your body fat with our body fat percentage calculator. Remember that no calculator, however complicated, can replace a visit in a doctor's office. You should treat this result as a rough estimate; it can only tell you if your body fat percentage is drastically too high, but there's no reason to panic if the result differ slightly from the recommended value. Weight: simply weigh yourself. You will get the most accurate result weighing yourself in the morning, before breakfast, and without clothes on. Waist: your waist is the narrowest part of your torso. The measuring tape you bring around your waist should sit tightly, but it shouldn't "dig" into your skin. Don't pull your stomach in, either. Forearm: the forearm circumference is only needed to calculate the body fat of women. Put your tape around the thickest part of your forearm (close to your elbow). Wrist: wrap a measuring tape around your wrist in the fullest part. Again, this measurement is not required for men. Hip: you measure your hips it the widest point below your waist. Remember to remove your clothing and to keep your feet together so that the measurement is as accurate as possible. Men don't need this measurement either for calculating the body fat percentage. Both equations for lean body mass use weight in pounds and all other measurements in inches. If you are using other units, you can transform the formulas accordingly. Once you calculated your body fat percentage, you should compare it with the recommended values. The list below comes from the American Council on Exercise and shows the average percentages in specified groups. This data means that if your body fat percentage is lower than 31% for women and 24% for men, you are in the average range and you have nothing to worry about. Higher levels of body fat may be dangerous for you. The chart below shows the average body fat percentages of Americans from samples between 1999–2004. It is taken from the National Health and Nutrition Examination Survey in the United States. Heart diseases: obesity and high levels of body fat can lead to high blood pressure and high levels of bad cholesterol, which are also risk factors for heart diseases. In extreme cases, they can lead to strokes, the third most common cause of death in the United States. Male hormones problems: high body fat level in a woman's body can lead to an excessive production of male hormones, causing facial hair growth and acne. Diabetes: high body fat can lead to type 2 diabetes. There's a strong correlation between diabetes and being overweight; people most at risk for developing type 2 diabetes are those who have a high body mass index (BMI) and a high body fat percentage. Pregnancy complications: Women with high body fat levels are more likely to give birth prematurely or have children with health problems, including obesity. They are also more likely to need a Cesarean delivery. If you type "how to calculate body fat" into your search engine, you will discover that there are multiple methods for measuring the body fat percentage. In fact, there are even multiple different formulas used in various calculators. The list below gives you some alternative methods. Underwater weighing: fat cells in humans have a density of 0.9 kilograms per liter. The lean body mass has a higher density - 1.1 kg per liter. Knowing this difference, it is possible to determine the density of the whole body by submerging it in water. After making some corrections for air in lungs, you can calculate the percentage of body fat with only a small uncertainty. Skinfold method: it is a method, in which you pinch your skin in several standardized places with calipers and measure the thickness of the fat layer. It requires from three to seven measurements. The drawback of this method is that it only measures the adipose tissue layer directly below the skin, and doesn't take into account any internal body fat. From BMI: there are some formulas that allow body fat percentage to be calculated directly from the BMI. They are not really accurate, though, as the amount of body fat for two people with the same BMI might be completely different. Ultrasound: it can be used to measure tissue structure and hence the amount of adipose tissue directly below the skin. Reducing body fat is not the same as losing weight. It's not enough to lower your calorie intake and hope for the best. We listed a few basic rules for you, but remember that it is always better to contact a dietitian before starting any diet. Go for long-term: you should plan losing your body fat in long term, starting with some moderate exercises and gradually increasing their intensity. If you are really obese, you should begin with the basic exercise of walking. Do both weight lifting and cardio exercises. Varying your exercises will keep your body from adapting and will cause faster loss of body fat. Plan a good diet that includes less saturated fats. You still need some fats, though, but try to settle for oils instead. You can read more about a balanced diet in the description of our calorie calculator. Do not overextend! You may end up hurting yourself if you eat too little. Our BMR (Basal Metabolic Rate) calculator will tell you what the minimum number of calories are for your body to survive. You cannot eat less than that! You still have to add a number of calories spent during your daily activity. Remember, reducing weight is a longterm process. Drink lots of water. If you exercise a lot, you lose water first, so it's a good idea to keep yourself hydrated. You can drink tea, too. Pick proper snacks. Never go for sweets, candy bars or other high-fat snacks. Choose fruit and vegetables instead. Never settle for a "miracle diet" plan you found somewhere in internet. It may be totally unbalanced and dangerous for your health! Plan some "cheat days" in advance, for example family gatherings. You probably won't be able to avoid that second serving, so it's better to plan it rather than feel guilty about it. Check your progress with our percentage change calculator. It will be motivating to see that you have lost 10% of your original weight! Reading all that things you may start to think; "fat is bad and it would be the best to have non of it at all." But is that really true? Let me give you examples! Andreas Münzer was an Austrian professional bodybuilder. In his preparation and training he used multiple ergogenic acids, steroids, diuretics. He was known for his extremely low body fat levels. Unfortunately, his drug taking lead to complications, and he developed upper gastrointestinal track bleeding, which caused his death, because he had no fat to cope with the medical stress after the surgery. However, no body fat happens not only to bodybuilders. Lizzie Velásquez is a famous American motivational speaker and YouTuber. She suffers from extremely rare congenital disease called Marfanoid–progeroid–lipodystrophy syndrome. One of its symptoms is preventing body from accumulating fat tissue and gaining weight, what causes that such patients have zero percent of body fat. She has never weighed more than 29 kg and is required to eat about 8000 calories daily! As you can see, fat is not all bad, excess fat is bad! 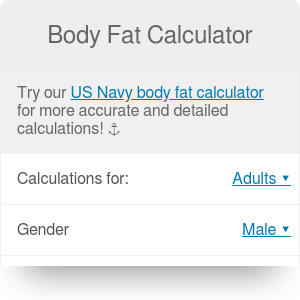 Body Fat Calculator can be embedded on your website to enrich the content you wrote and make it easier for your visitors to understand your message.